Another head-spinning week of polit news, although there’s been no major headlines the past few days on the Russian scandal, other than Donny Jr. getting grilled again by the Dems in another all-day interview in front of the Senate intelligence committee. But we must be getting closer than ever to Mueller’s team unveiling some impending major revelations about the scandal & perhaps a dramatic smoking gun, based on the maniacal desperation we’re seeing coming from every corner of Trump world. Many Trump minions are sensing their hero is now so hopelessly trapped, the Hail Mary they’re throwing out there is to discredit or remove Mueller as their last-ditch attempt to save this presidency. And Trump by bashing the FBI only to try saving himself is diminishing the reputation/authority of the bureau & undercutting the ability for them to do their vitally important job. The attacks on Mueller & the FBI are indeed strong indications of guilt on the part of Trump & his accomplices over the Russian scandal, since rather than working with investigators to uncover the truth, they instead are doing everything possible to distract & discredit the investigation. By convincing their Trumpeter base the probe is not legit, the White House will have them on their side at whatever point the evidence of criminal activity is released to the public. They’re doing a splendid job of convincing their base the investigation is so hopelessly biased that Mueller’s findings won’t matter, which is being swallowed by that crowd because they’re so incredibly naïve & believe practically everything Trump/Fox have to say. Fortunately, the vast majority of Americans have their heads screwed on straight & will be perfectly capable of objectively analyzing the evidence when Mueller chooses to release what he’s found. In the end, what matters is what Robert Mueller’s investigation produces. So far, there hasn’t been a shred of evidence that it has been anything but professional. Perhaps the indictments and plea bargains he has obtained so far will be the end of the story, and he’ll conclude that there was no further wrongdoing, particularly on the president’s part. But the possibility that he’ll find a great deal more — and present it with unimpeachable evidence — is precisely what has Republicans in such a panic. We start off the related articles below with the Russian updates, which then progress (actually digress) to the GOP/echo’s unwarranted criticisms of the Mueller investigation & Trump’s inability to accept intel reports on Russia. The U.S. President not only doesn’t have a firm grasp on reality, he won’t believe the truth which professional experts have gone to great lengths to gather, analyze & present to the commander-in-chief. This is truly terrifying in such a dangerous world, our prez is making critical decisions without grasping the facts. It fits a pattern where Trump rejects objective evaluations from sources he should be trusting & working with, such as the intelligence community, legal community & the media. And he’s built up a similar distrust among his base. If we don’t preserve our democratic heritage, institutions & ideals now, what kind of future are we leaving for ourselves & descendants? So as to avoid confrontations, his intelligence officials can’t even give him the straight story on all the underhanded things the Russians are doing, since Trump goes ballistic over negative reports on Russia. So he’s basing his judgments about a dangerous adversary on false or incomplete information. Trump’s incompetence comes through in so many different ways. 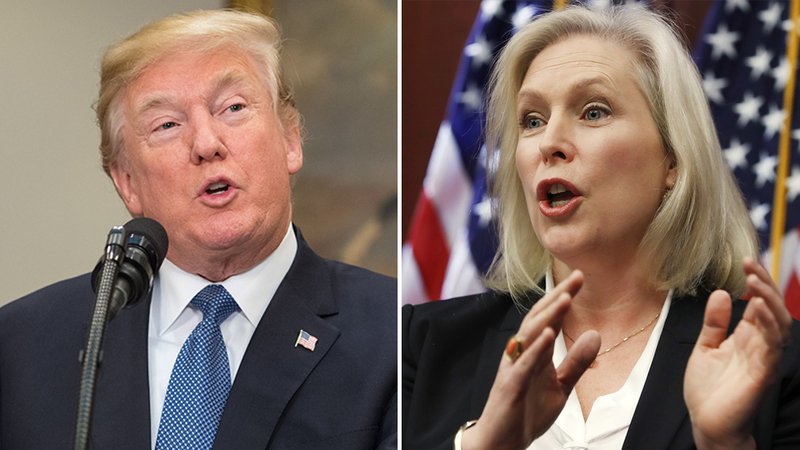 A president who would all but call Sen. Kirsten Gillibrand a whore is not fit to clean the toilets in the Barack Obama Presidential Library or to shine the shoes of George W. Bush. This isn’t about the policy differences we have with all presidents or our disappointment in some of their decisions. Obama and Bush both failed in many ways. They broke promises and told untruths, but the basic decency of each man was never in doubt. Donald Trump, the man, on the other hand, is uniquely awful. His sickening behavior is corrosive to the enterprise of a shared governance based on common values and the consent of the governed. In other articles from the newsfeeds, sure, we all know Moore’s creepy dating history cost him the election, but it’s still stunning a Dem could win a statewide election in Alabama. Kudos to Alabamians who rose above an election of right vs. left, & instead, making it more about right vs. wrong. In refusing to concede, Moore still seems to be in as much denial over the election results as he was about molesting teenagers. Many GOP leaders are privately relieved (with some not so secret about their elation) they won’t have to deal with him in the Senate. And Jones could be uniquely positioned to set the example for bipartisanship in the Senate. But the election results are a referendum on Trump, much like the recent Virginia special election along with other states where the Dems cleaned up. It’s also a slap in the face to Bannon, who was heavily invested in Moore’s campaign & expected to win in double digits. McConnell is absolutely correct about Bannon, in that Bannon specializes in propping up extremist candidates who lose. Voters are sending a clear message the Trump-Bannon-Hannity & other echo-knucklehead’s version of their radical politics of nihilism, divisiveness & moral degradation isn’t going to work! So the significance of these special elections are the signals they’re sending, that the Trumpian-echo reckless brand of fanatical tribalism that sabotages bipartisanship & governing, ultimately self-destructs. From there we see increasing dangers from various hotspots in the world. In many ways, Iran may pose a greater long-term threat than even North Korea. As Iran develops their nuclear weapons & missile technology, they do have tremendous influence in their region with Shiite populations & direct ties to terrorist organizations. Finally, in the bottom links, we see Trump’s continually decreasing poll numbers & George Will presenting why Trump is now the worst ever president. The newsfeeds have been overflowing this week as you can see below, with Trump being quite the headline maker. He is also a clear & present danger, which more Americans need to be made aware of that fact. So as the polit world is on overload with the news headlines, please feast on whatever related articles are most interesting to you. As far to the left as these Kos articles really are, the far-right echo crowd should still review them. Little do they know at this point these reports will ultimately prove more accurate than the extremist echo-nonsense they now rely on.